Unless you were living without electricity I am sure you saw the phenomimon that is the Ice Bucket Challenge. It all started with Pete Frates, a former Boston College baseball player who was stricken with ALS and has decided not to raise the white flag. I find it's viralness so inspiring and very personal. As you may know, if you've been reading this blog or bought a copy of the Cowl for Nick that I had someone close to me who was diagnosed with ALS - the father of one of my best friends. We lost Nick over a year ago and it still stings. He was a generous, caring, funny and downright amazing man. He had a wonderful personality and humor that still shines through his wife, daughter, son and his beautiful grandchildren. He has left a wonderful legacy behind but, oh, how we all wish he was still here to enjoy it. To see the world becoming more aware of this disease and seeing ALS organizations around the globe benefiting from heightened donations is amazing. I even got pretty defensive for all the cynics who didn't get it. Awareness = progress. I often think of ALS when I see my son going through his bouts of paralisis. I imagine that his frustration is similar to those who are losing control of their muscles with ALS. Both persons are so sharp mentally but their bodies are unfortunately failing them. Of course, AHC (Alternating Hemiplegia of Childhood) affects a far less percentage (approx 350 cases in the US alone) and is not nearly as fatal as ALS but it still deserves attention of it's own. It's with that in mind I give you the James Cowl. 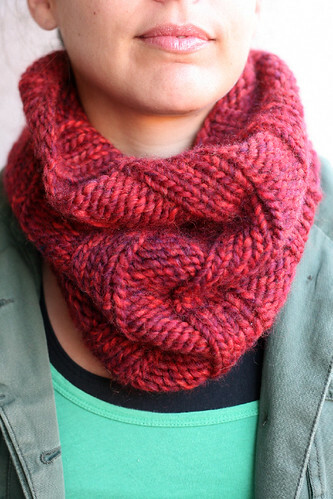 An easy, chunky cowl, knit up in no more than two-three days - a perfect last minute gift. All proceeds of this cowl will go to towards medical research in finding an effective treatment for AHC. In fact, 50% of the proceeds of ALL my patterns going forward with go towards AHC research. Right now all we have are experimental drugs and ideas of what can help. We need something more concrete. I often reflect on the philosophy of "What do you love to do? What are you good at? Who needs you to do these things?" Well it's time I offer my talents to this group of deserving people including my amazing son. Perhaps that's why I was gifted with this knit talent in the first place. If you want to donate or do more for our cause please visit CureAHC.org and AHCF.org to help! We are a small community but a hopeful and proud one. Our children are strong individuals and while they struggle with physical and mental road bumps, are the most inspiring people we have ever met. Buy a pattern, get TWO, or three ;-) Make a cowl, gift a cowl, share this post and keep warm. I had the fortune of traveling to the NY/NJ area a few weekends ago. It was my "pregnancy gift to thyself". I spent the weekend in Rhinebeck, NY surrounded by knits, fleece, friends and apple cider donuts and the week in NJ with some family before heading back to New England. I LOVE going to the NY Sheep and Wool festival. I still can remember my first time . I was SO giddy about seeing yarn and wanting to savor every moment. That first year I got myself a coffee mug from Jennie the Potter - ON A SUNDAY, WITHOUT A WAIT. Oh how times have changed! This year, on Saturday, I stood on line (at around the time of the festival opening) - all 32 weeks pregnant - for about an hour and a half and didn't even get a coffee mug with a handle. I did though get a handle-less mug, a small bowl and some stitch markers. While I realize I may have been "crazy" to wait so long, I also didn't get there at 7:30 am - which is what I heard others did. It was amusing standing on line. So many people walked by asking what on earth we were waiting for. Some scoffed at the idea of waiting so long for pottery, others just nodded their heads in approval and understanding. I figured this would probably be the last time I would do this for a while so might as well stick with it. I am truly amazed and thrilled at Jennie's success! I tried thinking of similar pottery available like hers and there simply isn't any. I had a chance to say hello to her on Sunday and of course she was without a voice. I hope she got to put her feet up and drink a whole bottle of wine to herself on Monday. From there I decided to walk the festival - slowly. Actually, I didn't even get to see it all because well, I am very pregnant and no matter how much "umph" I was trying to give myself my body need to SIT. Sitting and watching the fair offered up some great memories too. Matchy-matchy sweaters, some outrageous knits and good ol' husbands and boyfriends there to lend a hand with holding bags and bags of yarn made me smile. The new M"ewe"sic yarn from Green Mountain Spinnery, a few skeins of Jill Draper's Mohonk in Capiz Shell (which I kept asking her if she mean Mo-hawk or Mo-hunk? oh my Jersey accent), some O-Wool Balance Bulky, buttons from Melissa Jean and of course some Soak in the Fig scent. On Sunday I got to see a few old friends from Hoboken. They travel together each year from Patricia's Yarns. Nothing like sharing a few apple cider donuts and some good convo to end the weekend on a high note. I also spent the weekend with some wonderful knitting friends in a cozy house a few minutes from the fairgrounds. It was the 2nd year I had done this and I can't see going to the festival any other way! Speaking of Patricia's Yarns, no trip to NJ is complete without a visit to her shop! I fully believe in supporting your LYS and since Patricia's was one of my firsts I had to get some yarn while I was there. Lucky for me she had just recieved her shipment of Madeline Tosh! I got two skeins of the Tosh Light, and a skein of the luxurious Extra from Blue Sky, top it off with a tin of the Milk & Honey lotion bar, I was set! Oh the ever inevitable blog hiatus. Friends and knitters, life throws us curve balls, hail storms and road blocks. In this year of 2014 I think I got thrown all three (and MORE). It all started in January when my son experienced a very long hospital stay. Things had been fishy from the time he was born. There were moments when he wasn't himself and no doctor could exactly tell me why. We had two shorter hospital stays which resulted in diagnoses of reflux or migrane headaches. In wasn't until after that last major hospital stay he was finally diagnosed with a rare neurological disorder called Alternating Hemiplegia of Childhood. It's one of those, "Wait, that exists?" type of things. You can read more of that story on the Cure AHC website. To say it was a blow to me in every way is an understatement. Despite my ever positivity on the matter, the anxiety and stress of that dianosis sucked every creative juice from my body. In fact I am a surprised I got my part of the From Mama,With Love out the door but I had such a wonderful support group in the other designers that it wasn't as hard as it could have been. I even squeeked out a project for Knit Collage in there (more at another time!). But honestly, overall I didn't feel like knitting a single stitch... and that lasted for a long time. Since then, I've slowly been coming out of my creative fog. I started a new pattern (my own) and a new simple yet beautiful project from Carrie Bostick Hoge, her cardigan/shrug - Maeve. The simple stockinette and garter stitches of that pattern have been a lifesaver - slowly knitting me back to my former self. Soon after we learned of James diagnosis we found out that we were expecting another baby!! A bit of a surprise but one we are so thankful for. As James grows and explores his world we are so grateful that he'll have a best friend along for the crazy ride. While I am speeding closer to my due date, I am still not over the fact that I am going to have TWO children at year's end but I am beyond excited. Finally, perhaps the best piece to my return to form is that we moved to a new home in July. This transition has been so uplifting. It's amazing the change in attitude and mood one can have when you are in a space you love. I even think James' overall self and attiude has improved. It's definitely a change that has been a blessing. All these mega, huge, and colassal things have brought me back to a point where I feel like I can blog again. I am excited again. I can share again. I am not promising a ton of posts but I think I owe it to myself to enter back into this arena. I feel ready and am inspired by so many projects and knitting relationships! I do plan on sharing my experience with raising James with AHC and may throw in some anecdotes of him and our journey. So bare with me on that. You can always skip forward to the knitting! But if you know me, you know I am so proud of my son and I know his life is going to be a truly fulfilled and blessed one. If you happen to still have my link dear reader... thank you! I appreciate not being deleted. And thank you in advance for your thoughts, prayers, congrats and hopes... it's truly community that strengthens. Knit on with confidence and hope through all crises. And I believe me I certainly will try. From Mama, With Love Blog Tour! 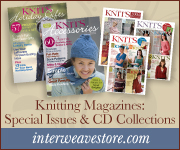 We are so thrilled that our knit friends and sponsors will be reviewing our new e-book. Please check them out as some are doing giveaways (both the e-book and some YARN!). Monday, April 7th, Melissa LaBarre of Knitting School Dropout **Designer of FM,WL! Tuesday, April 8th Tanis Gray of Tanis Knits **Designer of FM,WL! Monday, April 14, Kate Gagnon Osborn of Things for Charlie (And KW) **Designer of FM, WL! Monday, April 28th, Ysolda Teague Guest Blog Post! Tuesday, April 29th, Karida Collins of Neighborhood Fiber Co.
Tuesday, May 13, Jessica Correa, of Dream in Color Yarn Co.
And be sure to join our From Mama, With Love group on Ravelry. We're kicking off a KAL very soon! James will be waiting for you!! Introducing a new 5 designer, 15 pattern collection, From Mama, With Love. I am so thrilled to be a part of an all-star design team: Tanis Gray, Connie Chang Chinchio, Kate Gagnon Osborn and Melissa LaBarre! We are all moms who wanted to make knits for our children to share with you. I have 3 patterns in the collection: The above Ferris Vest (which yes is named after Ferris Bueler - an omage to the coolest teen from the 80s), the Debonair Hat and the Snuggly Boppy Cover. Did you know that there's actually no boppy cover pattern in Ravelry or on the interwebs?? I've looked! I've been using my boppy religiously since James was born. Even now as a playroom pillow. I thought, how great would it be to have a knitted cover?? The shape was a bit of a challenge but add in a few short rows it turned out to be pretty simple. I am so thankful to be able to make these pieces for my son and hope you all will check out the collection and start knitting asap! Check out the rest of the collection in Ravelry! The Anita cowl, named for my mother, is knit in Quince & Co's Puffin yarn. Using a 10.5 needle, it's a super quick knit! 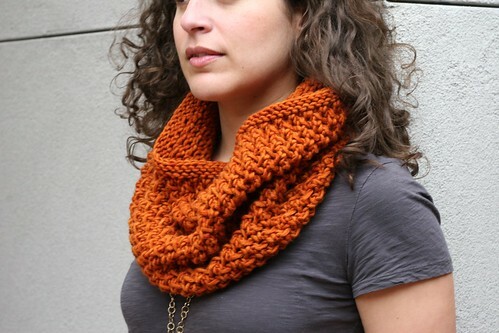 The cowl is a super long loop that can be worn up to three times around the neck. Perfect for these Polar Vortex mornings! I am so thankfully that I got to be a part of this collection for Quince & Co.! I hope you'll all check out the full collection! Following one pattern release with another! Say wha!? This beauty is called Swirly, in Knit Collage's new yarn, Swirl. I'll let Amy give you all the details here! Hope you check it out! So as you know, it's taken me a while to sit down and finally blog again. Getting my apologies post out first I thought I'd follow it with a new pattern! My color block drop should sweater, Kendi! From inspiration, to color choices, and finally knitting, I truly enjoyed each piece of this sweater. And who knew we'd have one of the snowiest winters in New England so she's gotten lots of wear. Thrown over a t-shirt and jeans and it's the perfect go-to for these blizzardy days. I actually had this sweater done in time to wear it at Rheinbeck, which is evidenced here! I must thank my friend, Thea for helping me with my photoshoot! When you put us together, you never know what kind of hilarity ensues. We had fun taking some glamour shots of which you can find more on her blog. Yarn - Malabrigo Worsted, (100% merino wool, 210 yds, 100g) Color A, 1 skein, Color B, Marine 62, 2 (2, 2, 2, 3, 3) skeins, Color C - Holly Hock 148, 2 (2, 2, 3, 3, 3) skeins, Color D - Pearl 36, 3 (3, 3, 4, 4, 4) skeins. Needles - US 8 (4 mm) Adjust needle size if necessary to obtain the correct gauge. Notions - Markers (m); tapestry needle. Gauge: 22st and 28 rows = 4” Granite Rib Stitch after blocking. Get the rest of the details for Kendi and buy your self a copy in my Ravelry Store! Well, friends, this is me once again dusting my shoulders off and trying to get back into a groove. This parenting business is no joke and while I am loving every minute of it I am trying to learn how to manage my free time and sleep as best I can. Getting that whining out of the way, let's talk KNITTING! I was thrilled to see my cowl featured on the front page of Ravelry!! 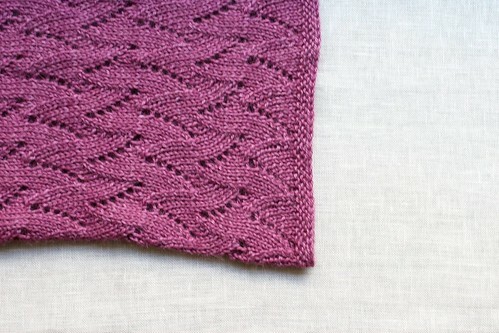 The Luxe Cowl was one of the first patterns I published on the blog. I'm so happy that it's still so popular! Hurray cowls! I'm also getting a post together to finally show you my Kendi sweater! The "for me so that I can blog about it" sweater! With some help from Thea of Baby Cocktails with the photos and a quick send off for the pattern to be reviewed it's "put a fork in it" done. I have a few other sweaters that have been collecting dust around the house that I'm finally getting around to publishing. One is from 2010! Remember this gem? To think I knit that in 5 DAYS... and it's nearly taking me 5 years to get it published. I'd say it's "just in time for spring" but seriously with this snow!? Thank as always, for sticking around!! I actually had written this post way before I saw (and others pointed out to me) that my Luxe Cowl is Hot Right Now on Ravelry! I couldn't be more excited! It's a super simple yet lovely pattern. Perfect for the last minute knitted gift. I love me some cowls, too. As I got a fever and the only remedy is more COWL. 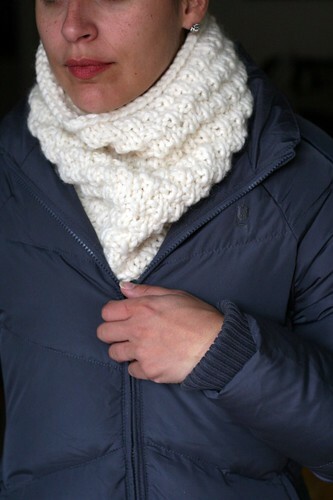 The cozy and bulky, Snow Cowl. Made from gorgeous and soft Fibre Co. Canopy, The Felicity Cowl. The newest cowl in my collection, The Hudson Cowl. Welcome! My name is Margaux and I love to knit. (a lot.) I currently reside in the metro west area of Boston, MA. Tentenknits is a journal of my knitting and crafty adventures with a bit of my crazy life in between. Interested in sponsoring tentenknits? Email me at margaux@tentenknits.com for more info.